The name “Frankenstein Island” conjures up an over-engineered theme park attraction, complete with ticket takers and souvenir circuit breakers. “Welcome to Frankenstein Island! Can I interest you in a bag of candy neck bolts?” Remarkably, what you get from the movie Frankenstein Island (1981) is something even more absurd. The movie follows a simple enough premise: a group of average men accidentally crash their hot air balloons onto a remote island after some freak over-water tornado. You may be thinking “yeah, that’s called a water spout,” but the narrator claims it was a tornado. The men are very quickly taken in by alien Amazonian tribe women, embroiled in dangerous scientific experiments that cross the line of human decency, and have to fight their way out using a machine gun that they never fire. Ready? Let’s get into this. The remote island in the center of the film does not see regular visitors beyond those who find their way through tragedy. First, there are the leopard-print bikini-clad Amazons, who introduce themselves to the men through stereotypical tribal dancing around human skulls. In fact, human skulls seem to be the decor of choice in this dusty tropical oasis, from casual placement on boulders to use as bongs. On an island with as few noticeable resources as this one, we admire the tribe’s creativity. There are also a few other men on the island. There’s Jocko, a laughing hyena of a human workhorse, and his crazy-bearded partner. Then there’s Clay Jayson, who has been sedated and imprisoned on the island since the storm crashed him there 17 years prior. Lastly, there’s Sheila Frankenstein von Helsing, whose stilted dialogue is matched only by the perfection of her Shirley Temple curls. She’s pretty busy taking care of her ailing 200-year-old husband. Based on her account, Dr. Frankenstein founded this island to continue his experiments and imposed some sort of martial law, imposed even from beyond the grave by John Carradine’s giant floating Wizard of Oz head. 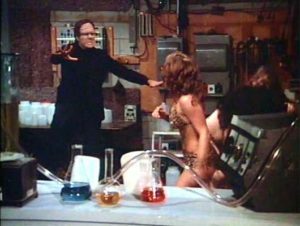 Frankenstein is kept “alive” through an electrically charged brain in a jar to disseminate “the power” from the other realm. The power! The power! The Power! THE POWER!! The men are invited to stay on the island to join the von Helsings’ scientific efforts. 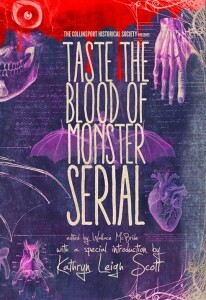 One man can’t resist the allure of Frankenstein’s experiments and goes to work in the lab with Sheila. The others work with the Amazons to build a raft, but are pretty quickly distracted by searching for a missing girl and fighting Frankenstein’s new monster come to life. We won’t spoil the spectacle that ensues, but don’t worry about the fate of Dr. Frankenstein’s fragile brain—there’s a backup brain hidden somewhere in case of emergencies. 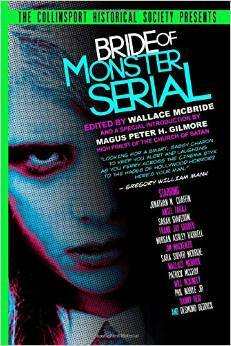 Here at Stuff Monsters Like, we appreciate reimaginings of our favorite monster tales … when they are done well. 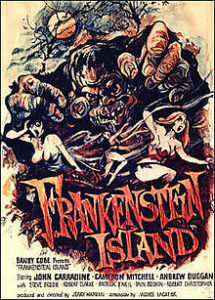 But Frankenstein Island is a travesty to all great Gothic literature including Frankenstein, Dracula, and The Island of Doctor Moreau. In addition to the poorly constructed storyline and bad acting you normally see in old low-budget monster movies, this one is riddled with jump cuts, unmemorable characters, and a decided lack of monsters (except for a few minutes during the climax). It’s no wonder RiffTrax took a shot at the movie. 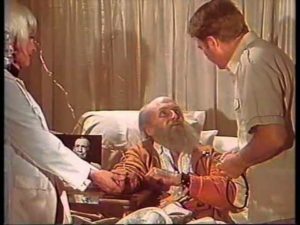 Dr Frankenstein, Frankenstein, Frankenstein Island, Horror film, John Carradine, movie, movie review.